Fresh from their travels, the ever-growing band of Burnley international players have returned for duty as the Clarets aim to avenge an early season 1-0 home defeat to the Baggies. Relegation threatened West Bromwich Albion and their beleaguered manager Alan Pardew, face Sean Dyche’s in form Clarets at The Hawthorns on Saturday, 31st March 2018 (Kick-off 15.00 GMT). Following two straight wins, including a 3-0 away victory at the London Stadium in exceptionally trying circumstances, Sean Dyche will be attempting to throw even more oil on Pardew’s relegation funeral pyre. Burnley old boy Jay Rodriguez will be amongst the men from the West Midlands side who will be hoping to stall Burnley’s unexpected march to Europe and earn three valuable points as the Baggies battle to stave off a return to Championship football. England debut man James Tarkowski and Nick Pope have returned to the Burnley fold following their week away with the England camp. The big question looming large for Sean Dyche is whether to retain faith in World Cup hopeful Pope or select the fit again England shot stopper and Burnley skipper Tom Heaton. That’s quite a quandary for the Burnley gaffer! 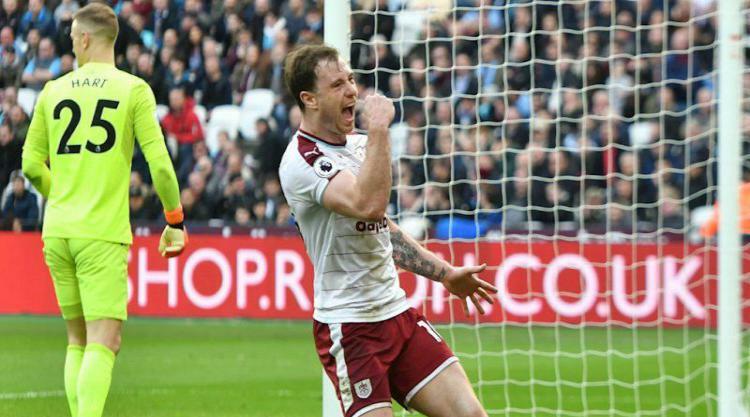 Tarkowski will no doubt put behind him the controversial penalty awarded against him by VAR. The Burnley centre back will look to impress from now on in and earn himself a seat on the England aeroplane to Russia for the World Cup finals. I expect Sean Dyche to select a starting eleven that will do a containing job on what will undoubtedly be a West Bromwich Albion side that will look to go off on the offensive from the referee’s opening whistle. If Dyche’s recent tactics are any barometer the Baggies will need at least a one goal cushion before Burnley try to nick all three points in the final quarter of the game. Pope, Lowton, Tarkowski, Mee, Ward, Gudmundsson, Cork, Westwood, Lennon, Hendrick and Barnes. Tom Heaton, Chris Wood, Phil Bardsley, Kevin Long, Charlie Taylor, GK Nkoudou and Nakhi Wells could all feature from the Burnley bench. For what it is worth, I am putting my money on a 2-0 away win for the Clarets, with the relentless Ashley Barnes scoring again as he presses his claim for a place in the Austrian World Cup squad (TEC).